There is a prestige that comes when a student holds the responsibility of being an athlete to represent their educational institution. Though it is an honor to be an athlete as the school does give high regard and extra credentials as you finish your studies, there is a level of accountability that the student has to maintain. As a student-athlete, there are many elements you have to maintain. 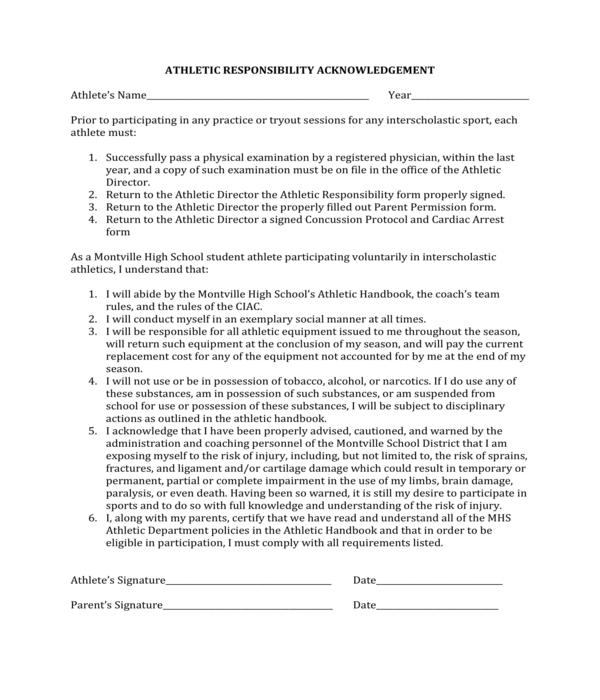 In this article, we tackle on the importance of having an athletic acknowledgment form in a school athlete’s life, why it is important to have one, and what are the elements of an athletic acknowledgment form. Health – The athletic acknowledgment form allows for the protection of the athlete’s well-being due to the fact that there is pressure to gain success through sports. Being an athlete often allows the individual to push the limits and capabilities of their bodies in order to achieve their goal of winning as athletes are compelled to adhere to regular after-school training and practices. To Inform Regarding Risk Factors – There are many common injuries that athletes are at risk to especially when involved in contact sports. It is important for both the athlete and their parent, especially if the athlete is not yet of legal age, to be aware of certain injuries that are more prominent among athletes, as well as give signs and symptoms of certain injuries or even organ failures. Student Duties – This is to remind the athlete that although sports can improve their academic standing in school, they must also do their part in keeping up with their studies. In most institutions, they can only allow their athletes to compete in their field as long as a certain grade point average is achieved to ensure that their athletes continue to be academically focused. Responsibilities as School Representation – Most especially when an athlete is competing in an interscholastic event or is wearing their athletic attire outside the premises of the school grounds, the athlete must be reminded that they are a continuous representation of their institution. Therefore, proper conduct must be observed at all times as they are a reflection of the training that the school has enforced in them. Accountability – There are other responsibilities that athletes will be liable for especially in terms of maintaining gym and sports equipment. 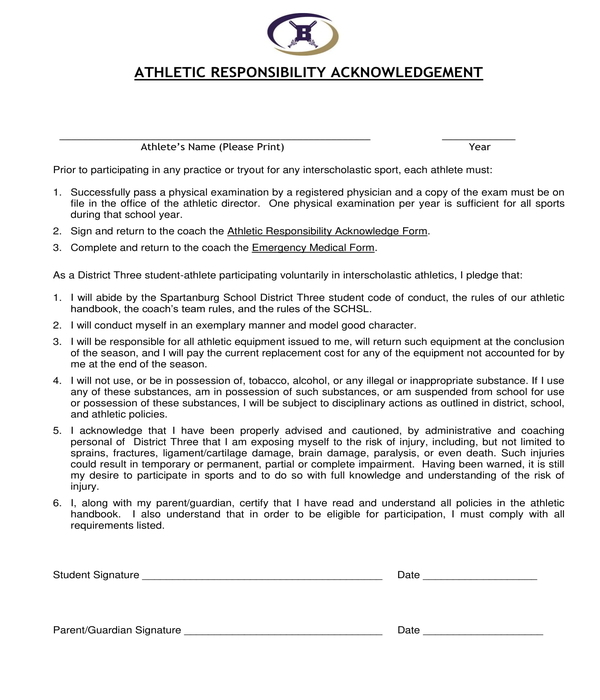 The acknowledgment form allows for the athletes to be aware that they will be accountable for the things that they use. Awareness of Responsibilities for Athlete and their Parents – There are many components that an athlete must be aware of and responsible for and their parents must also have an understanding of these responsibilities to scaffold them when they are at home. Prerequisite Medical Certificate – This is further proof that the athlete is of excellent health and that it has been proven by a medical professional. They may also use physical health forms to ensure this. Though athletes are more susceptible to common sports injuries, and the likelihood of concussions or organ failures are high when athletes go beyond what their bodies can handle, when athletes are proven to be of impeccable health, the less worry and liability the institution holds. 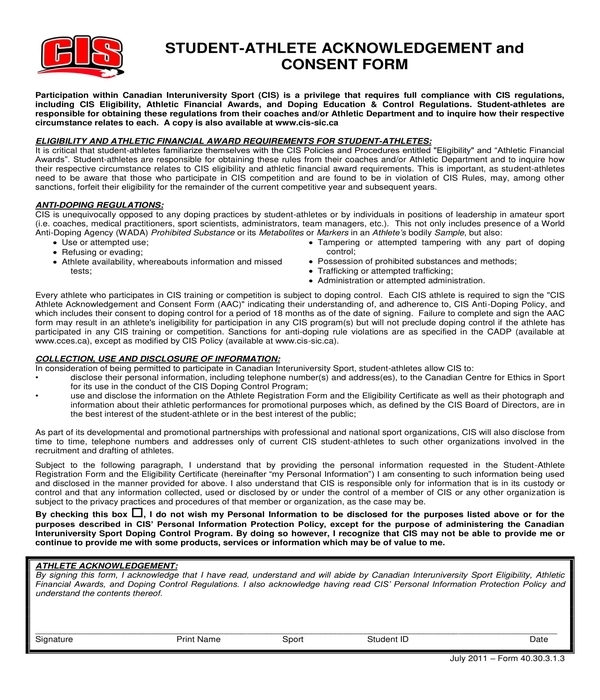 Consent of Parents or Guardians – Along with other activities that athletes have, the consent must also be included in the athletic acknowledgment form, especially for those athletes who are not yet of legal age. This is fundamental as there are many youth members who still need guidance from adults, especially during decision making. You may attach a separate consent form for parents and guardians or also include it in the athletic acknowledgment form. Eligibility to Become an Athlete – Not including an individual’s athletic abilities, there are more characteristics that make a person to be part of an athletic team such as a maintaining grade point average, diligence in training and practices, participation in related school activities, etc. Mention this explicitly in order for the athletes to continue managing their school works and extracurricular activities. Rules and Regulations of the Team – Different institutions have different rules. Add in empirical rules that the athletes must adhere to in order to maintain peace and order for the entire team. Some rules may include the management of equipment, possession of alcohol, tobacco, marijuana and other illegal drugs, etc. Expectations as School Representatives – The athletes must understand that they are the delegates that represent their educational institution, therefore that they must present themselves in a respectable manner, and must have good moral character. Fact Sheets for Sport’s Related Injuries and Diseases – The athletes must also be aware and knowledgeable regarding the risks that come with conducting regular strenuous activities, especially with contact sports. It would be helpful for the athletes and their parents to be informed regarding symptoms and treatments regarding common infections, diseases, and illnesses that athletes may get during their activities. 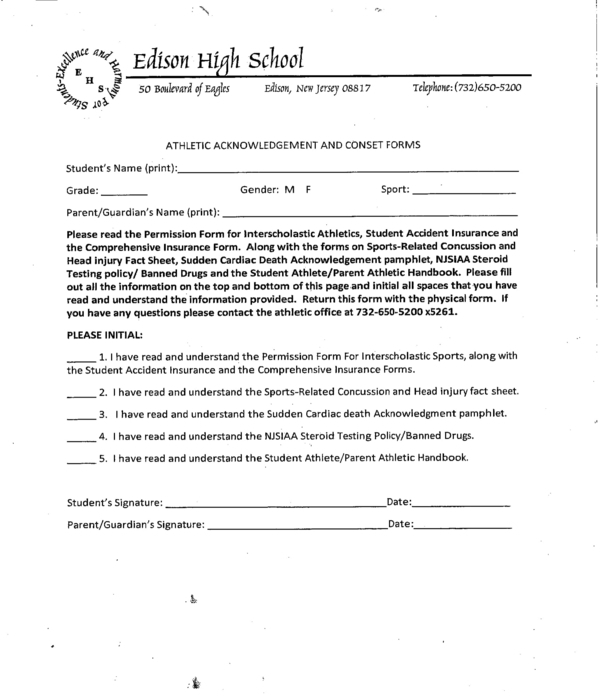 A cardiac arrest acknowledgment form and concussion acknowledgment form may also be attached along with the athlete acknowledgment form. Agreement to Adhere to the Sign Form – Before joining the team, all athletes and their parents must acknowledge and hand out the agreement form to their coach to ensure that they have understood the terms and conditions of the agreement. In order for an institution or even a coach to maintain the peace and order of an athletic team, rules and guidelines must be followed. Though it may not be an easy task to search for talent that can boost a team of talented athletes, making sure that the team, their guardians, and the institution must make sure that they have come to an agreement regarding matters that may only come up a few months into the season. This is only to protect not only the school but also make sure that the athletes understand the responsibilities that they must manage, as well as the physical and health risks that come with being an athlete.